This Grade II listed boutique hotel blends Georgian period charm with cutting edge modern touches, making it a unique place to stay. 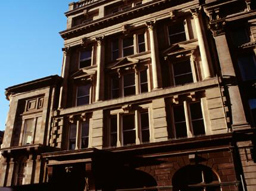 A 4-star gem set at the heart of Newcastle City Centre. Walk through the hotel reception area to enter the Living Room Restaurant - a contemporary piano bar and eatery, where you can start you day with a substantial breakfast before venturing out to see what Newcastle has to offer. The impressive dining room is available to enjoy throughout your stay. Indulge in some first-class dining or look out for specialist evenings and cocktail nights. The Grey Street Hotel offers a choice of rooms; from the standard chic and deluxe rooms to luxurious duplex suites, no two rooms are the same!! Enjoy the 100% cotton bed linen and award winning Hypno beds while watching your own plasma or LCD TV's. There is a free DVD library if you require an quiet night in. Sony PSPs can also be hired for free. All Grey Street rooms have freshly ground coffee and herbal teas on offer and in-room laptop safe. The triple glazed windows protect you from any unwanted noise of city life. The suites also offer extras such as waffle bathrobes, mineral water, a larger range of exclusive toiletries and an ipod docking station. The hotel is located next to the theatre and just a short walk from the Quay Side for culture, eating and craft markets. Newcastle's main shopping area is just a two minute walk up Grey Street, St James Park is only a 10 minute walk away, as is the Metro Arena.